What I love the most about buying seasonally is how much I look forward to each of my favorite items that slowly comes into season, grows into abundance, and then fades back out for the rest of the year. Spinach and asparagus start off the season for me. There is nothing like baby spinach pulled right out of the ground, and for just a few short weeks it is available in abundance, and then just as quickly it is gone. Asparagus hangs around for a little while longer, but then it, too, exits the stage. I especially look forward to sugar snap peas and snow peas. As a child, I hated peas and pushed many a one around my plate, looking for something under which I could shove it. Following the example of my older sister, I finally learned to mix them into my mashed potatoes and swallow them whole. Not the most satisfactory solution, but it got them down and I was able to leave the dinner table with the rest of the family. Those were canned peas, which I still detest. At some point my mother converted from canned to frozen vegetables, and I found that frozen peas were more palatable; I could chew them before swallowing them although I never really liked them. But on those rare occasions that my father would bring home fresh peas in the pod, I could not get enough of them raw. Uncooked, they did not have that mealy texture that I so detested in cooked peas. We would spread newspaper over the kitchen table and crack open the pods, scoop out the peas, and pop them into our mouths. Which is why I love both sugar snap and snow peas. Both are cooked in their pods, and I love them best when they are cooked barely enough to take off their raw edge. The last time they were available at the Green City Market, I bought both. I made this simple saute with the sugar snaps. I made an equally simple stir-fry with the snow peas. It takes about 10 minutes to prep this dish (ok, 15 if you have to toast the cashews) and another 5 minutes to cook it. It doesn't get much better than that. To toast the cashews: Preheat oven to 350 deg. F. Place the cashews in a small oven-proof pan or baking sheet in a single layer and cook for about 10 minutes, checking after 7 minutes to make sure they do not burn. Remove from the oven and place in a bowl immediately to keep them from cooking more and let them cool. Combine the soy sauce, rice vinegar, sherry and brown sugar in a small bowl. In another small bowl, combine the cornstarch with a tablespoon of water and stir to combine. Heat the wok over high heat. When it is smoking, add the peanut oil and swirl it around to cover the bottom of the wok. Add the garlic/ginger paste and let it sit for a few seconds before moving it around the bottom of the wok. 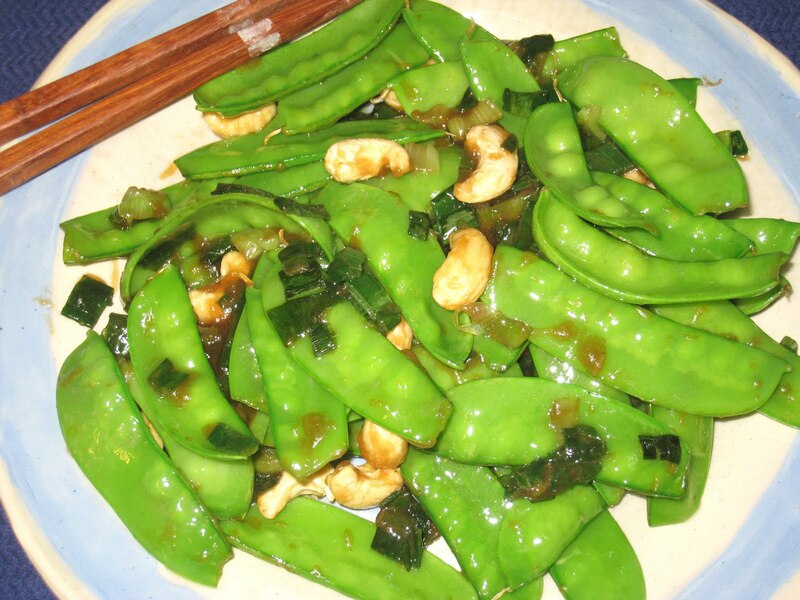 Cook for about 30 seconds, then add the snow peas. Cook them, stirring constantly, for about 1 minute. Add the onions and stir them once or twice around the wok before adding the soy sauce mixture. As soon as the sauce is bubbling, which will be almost immediate, add the toasted cashews, stir once, then add the cornstarch and water mixture. Stir until the sauce is thick and remove from the heat. Add the sesame oil, stir everything together and serve immediately.